Neil G. “Paul” Paulson, Sr. and Help the Vets, Inc., (HTV) will be banned from soliciting charitable contributions under settlements with the FTC and the states of Florida, California, Maryland, Minnesota, Ohio and Oregon, for falsely promising donors their contributions would help wounded and disabled veterans. Operating under names such as American Disabled Veterans Foundation, Military Families of America, Veterans Emergency Blood Bank, Vets Fighting Breast Cancer, and Veterans Fighting Breast Cancer, HTV falsely claimed to fund medical care, a suicide prevention program, retreats for veterans recuperating from stress, and veterans fighting breast cancer. 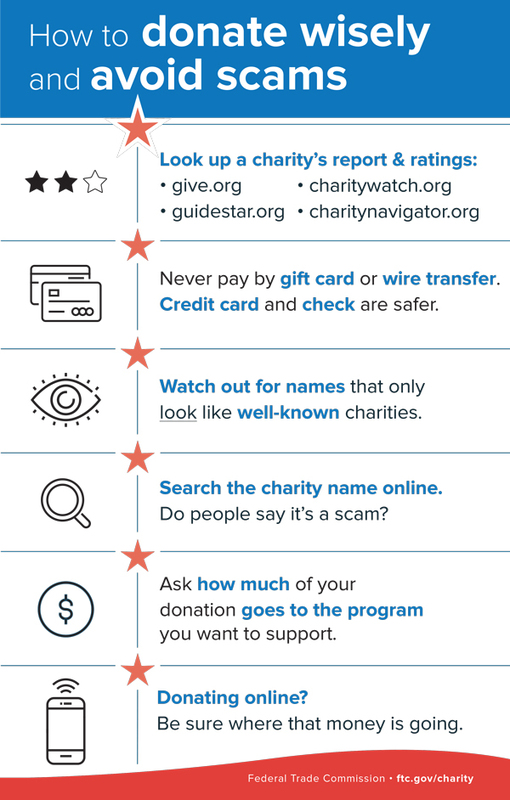 It also falsely claimed a “gold” rating by GuideStar, which provides information about nonprofits. One letter signed by Paulson stated, “But for thousands of disabled veterans who served in Iraq and Afghanistan, giving an arm and a leg isn’t simply a figure of speech – it’s a harsh reality. . . . Your $10 gift will mean so much to a disabled veteran.” But according to the FTC’s complaint, HTV did not help disabled veterans, and 95 percent of every donation was spent on fundraising, administrative expenses, and Paulson’s salary and benefits. The defendants are charged with violating the FTC Act, the FTC’s Telemarketing Sales Rule, and laws of the six states. In addition to the ban on soliciting charitable contributions, the proposed settlement order bans Paulson from charity management and oversight of charitable assets. To ensure that donors to HTV are not victimized again, HTV and Paulson must destroy all donor lists and notify their fundraisers to do so. The order imposes a judgment of $20.4 million, which represents consumers’ donations from 2014 through 2017, when HTV stopped operating. The judgment will be partially suspended when the defendants have paid a charitable contribution to one or more legitimate veterans charities recommended by the states and approved by the court. Paulson must pay $1.75 million – more than double what he was paid by HTV – and HTV must pay all of its remaining funds, $72,000. The FTC charged Travis Deloy Peterson with using fake veterans’ charities and illegal robocalls to get people to donate cars, boats and other things of value, which he then sold for his own benefit. The scheme used various names, including Veterans of America, Vehicles for Veterans LLC, Saving Our Soldiers, Donate Your Car, Donate That Car LLC, Act of Valor, and Medal of Honor. Peterson allegedly made millions of robocalls asking people to donate automobiles, watercraft, real estate, and timeshares, falsely claiming that donations would go to veterans charities and were tax deductible. In fact, none of the names used in the robocalls is a real charity with tax exempt status. Peterson is charged with violating the FTC Act and the FTC’s Telemarketing Sales Rule. At the FTC’s request, a federal court issued a temporary restraining order prohibiting Peterson from making unlawful robocalls or engaging in misrepresentations about charitable donations while the FTC’s enforcement action is proceeding. In the state actions announced today, charities and fundraisers sought donations online and via telemarketing, direct mail, door-to-door contacts, and at retail stores, falsely promising to help homeless and disabled veterans, to provide veterans with employment counseling, mental health counseling or other assistance, and to send care packages to deployed servicemembers. Some actions charged veterans charities with using deceptive prize promotion solicitations. Others targeted non-charities that falsely claimed that donations would be tax deductible. Some cases focused on veterans charities engaged in flagrant self-dealing to benefit individuals running the charity, and some alleged that fundraisers made misrepresentations on behalf of veterans charities or stole money solicited for a veterans charity. The Commission wishes to thank the National Association of Attorneys General and the NAAG Charities Committee for supporting this effort. The Commission vote authorizing the staff to file the complaint and proposed stipulated final order against Paulson and HTV was 5-0. The documents were filed in the U.S. District Court for the Middle District of Florida, Orlando Division. The proposed order is subject to court approval. The Commission vote approving the complaint against Peterson was 5-0. The U.S. District Court for the District of Utah, Central Division, entered a temporary restraining order on July 10, 2018. NOTE: The Commission files a complaint when it has “reason to believe” that the law has been or is being violated and it appears to the Commission that a proceeding is in the public interest. The case will be decided by the court. Stipulated orders have the force of law when approved and signed by the District Court judge. 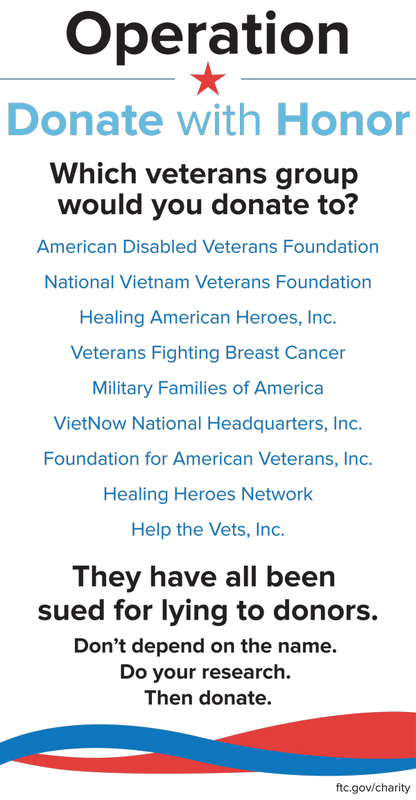 Infographic: Which veterans group would you donate to?